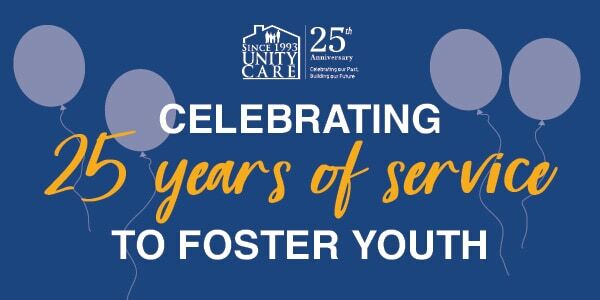 Happy 25th Birthday, Unity Care! On this day, August 14th, 25 years ago, we opened our doors and accepted our first youth into House 1; his name was George. Our journey has been an amazing one, filled with so many stories of joy, challenges, tribulation and success! From the beginning, we have never wavered from the path that God put us on – to provide quality youth and family services for the purpose of creating healthier communities through life-long partnerships. Over 25 years, we have grown from 1 youth and 1 employee in 1 home, to over 200 employees and 24 different programs serving 7500 youth and families per year. I am extremely proud and blessed when I look back at the journey of these significant and remarkable years as we’ve emerged through every storm stronger, with a keen focus on our number #1 priority; our youth!! We’ve had hundreds and even thousands of graduation ceremonies, sending youth back home to their families, and emancipating them to adulthood. We’ve also had hundreds of youth who didn’t succeed – and that’s a very tough reality, seeing the trauma, the pain, and loneliness in the eyes of these children and youth who are wounded. They’ve bounced around from foster home to group home, school to school, with no sense of family connection or a strong will to survive another day in this maze. As we set our foundation for the next 25 years, it’s inspiring to reflect back on our journey, but it’s even more exciting to look head to our future. With the current changing landscape of foster care and the unrelenting chaos and divisiveness in our country; our communities, our youth and our families need us more than ever. Throughout the years we’ve had an amazing assortment of dedicated, faithful and committed people who believe in our mission and core values – our board of directors, our staff, and our volunteers have been 2nd to none and have helped lay the foundation of this agency one brick at a time. On Unity Care’s 25th birthday, let’s pause and remind ourselves of why we so diligently put on our armour of protection and go to work as servants, providing hope and inspiration, and keeping those we serve safe. We also pause in gratitude, for our many donors, volunteers, and supporters who have unselfishly donated their time, talent, and treasures to make a difference in the lives of our foster youth. To our awesome Board, Staff, Supporters, and Volunteers: You’re the best!! Thank you for your invaluable commitment; keep up the great TEAM work (Together Everyone Achieves More).We look forward to an amazing journey ahead.